""GSP’s survey services provided the data we needed to have a comprehensive understanding of each site location - from the services offered at each site down to the exact dimension of every wall, window and sign."" 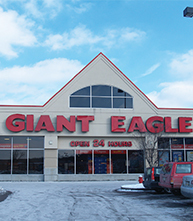 Giant Eagle is a grocery chain headquartered in Pennsylvania that operates more than 400 grocery and convenience store (GetGo) locations throughout the Northeastern United States, primarily in Pennsylvania, Ohio, West Virginia and Maryland. The retailer was looking to have a better understanding of all the supermarket and convenience site locations and work towards improving retail marketing plans. They also wanted a solution to help them document and track the different assets and services available at each location to help empower their marketing, operations and facilities management decisions. 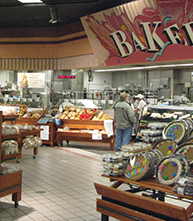 GSP’s Professional Onsite Surveyors conducted onsite surveys at 400 sites and provided a comprehensive retail profile with digital photos for each grocery location, including data such as the number of signs and assets (ie. freezers and ovens) in frozen foods and bakery, counter dimensions in the pharmacy, and how many carts where in the cart corrals outside. The data collected at the GetGo locations included the size of windows, number of pumps and car wash area dimensions. GSP also implemented their Site Intelligence software solution, AccuStore™ to maintain the data.